Whether you are experiencing broken or clogged gutters, or other common gutter issues, it is essential that you contact a professional gutter company to fix the problem. With a dysfunctional gutter system, the foundation and structural integrity of your home are at risk, so contact experienced gutter contractors is something you do not want to delay. However, with all the gutter contractors and companies in the area, choosing the right one can be difficult. 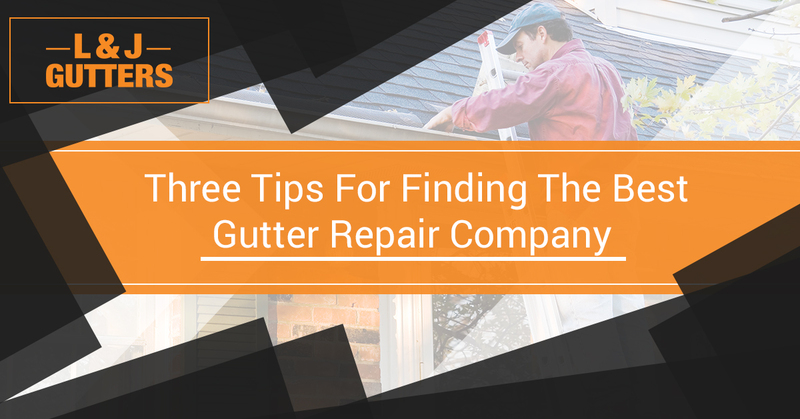 Luckily, we put together some tips to help you find the best gutter repair company. Choosing the best gutter company means not only receiving quality service, but being left with a quality gutter system that will last for years to come. You’ll want to be on the lookout for gutter scams offered by inexperienced contractors looking to make a quick buck off an improper job. When looking for a gutter repair service, here are some tips to help ensure you choose a reputable and reliable company. As much as it may seem otherwise, local businesses are still a thing. Instead of choosing big corporations for gutter services, choosing local, small businesses will not only save you money, but you are more likely to get better service. When in need of gutter repair, many homeowners tend to choose the company that offers the lowest prices. Of course, if you can get something cheaper, you are more likely to purchase it. Even if you have a budget you want to stick to, it is important to remember that not all cheap items are actually worth their price. Oftentimes, when you buy cheap items, you get low quality, and when it comes to gutter systems, low-quality is the last thing you want. The same thing can be said on paid services. If you cheap out on services, you should expect low quality workmanship. You should only save money on services up to a point. When you always choose the cheapest option, you’re going to lose. Sometimes, a gutter replacement is more cost-effective than continuous repairs due to an old and worn gutter system. If this is the case with your gutter system, you’ll want to not only choose an experienced gutter installation company, but you’ll want to choose one that offers a variety of gutter types. While aluminum gutters are typically the most popular option, seamless gutter, half-round gutters, copper gutters, and rain chain gutters are becoming more of a trending option for homeowners. A good gutter company will have the testimonials to back them up. You want to choose a company that has been doing business for a while, providing quality services. You can get an idea of a gutter company’s reputation by visiting their website and viewing their testimonials section. Are you in need of gutter repair services? Contact the team at L&J Gutters. We have been providing quality gutter service for 14 years. We strive to provide you with the service you deserve in a timely manner, without breaking the bank. Request an estimate today!